Kulture Shop, a unique Indian art and graphic design store is located in Kala Ghoda. Here’s a look at what lies behind that colourful shutter. 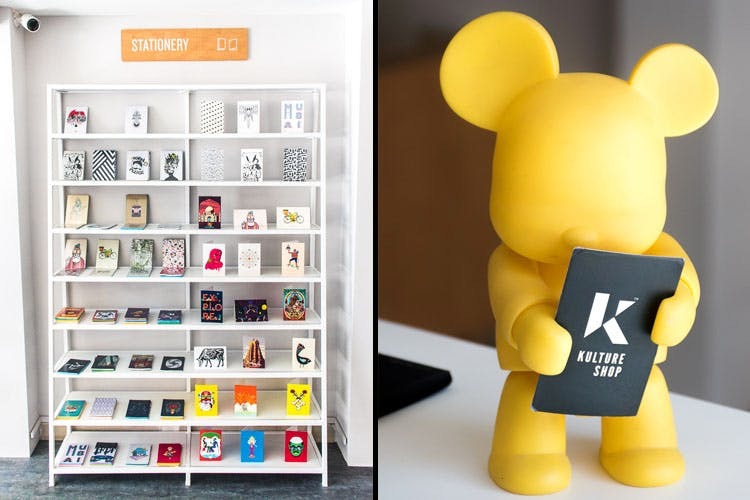 A common love of art, design and culture brought Arjun Charanjiva, Kunal Anand and Jas Charanjiva together, and in 2014, they began Kulture Shop, a collective of Indian artists whose work is available on their online store, their Bandra studio and outlet, and now their huge store in Kala Ghoda, Fort. The two-storey space welcomes us with a rather stony-faced entrance and bold typography over it. Inside the store, eye-catching colours, prints and patterns on a white wall take you in. The spacious store has neatly divided sections and walls full of colourful, engaging and thought-provoking art that automatically draw you closer to them. They’ve got tote bags, framed art, cushion covers, greeting cards, small notebooks, mugs and phone cases too. Each product comes with the artist’s name, a title and a description of what it is about. A few artists they have on board doing amazing work are Furqan Jawed – with his need weed typography are Sajid Wajid Shaikh, Sameer Kulavoor, Lokesh Karekar, Kunal Anand and Jas Charanjiva themselves, Kunel Gaur, Shruti Venkataraman, Khyati Trehan, among so many others you have to look out for. Upstairs, in a more cosy loft-like setting, they have graphic printed t-shirts for men, and women, and our favourite corner: the arts and lifestyle books. Personally selecting books that they have found useful and inspiring, there are titles such as V&A Pattern by Roli Books, a series on art forms by Taschen, Platform magazines, and several others. Soon they will also stock graphic novels, indie books and more art-based magazines here. Slightly unsure about what sort of art you like, or maybe even befuddled? They have a corner with a design lab where the store will help you discover what you like. Through the digital and a physical file, you can through colours, styles, and general words narrow down to what you may like in the store. It’s also super handy in finding a gift for someone. They even have a wall where they can put up different prints, so that you can visualise how a cluster of different artworks looks on the wall.